Finely slice the leeks, white part only; peel the potatoes, and cut into manageable portions. Heat oil in a heavy based frying pan, add the leeks and sauté until tender. Remove the leeks into a large saucepan or casserole, add potatoes to pan and toss in the remaining oil, allowing them to cook just a little. Add the potatoes to the leeks, cover with chicken stock, and allow them to simmer gently until the potatoes are tender. Puree the potato and leek mixture in a food processor, or pass through a mouli. Return to a clean saucepan, and add additional chicken stock until the soup is the required consistency. Add a little lemon juice if required. Season to taste. 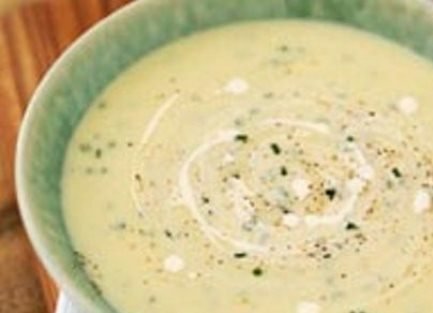 Vichyssoise is traditionally served cold, though it is delicious hot as well. Remember, though, that if it is frozen, it will lose its smooth consistency, which can only be regained by reheating. So if you intend serving it cold, it should not be frozen. Before serving, stir the cream into the soup. Be careful not to add too much, which will make the soup unpleasantly rich. Alternatively, serve the soup as is, and add a swirl of cream to the bowl.